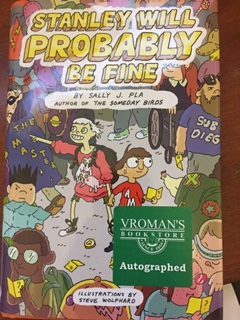 No one writes about neurodiverse kids better than Sally J. Pla. And I feel super lucky because I got my copy of her latest novel at my favorite bookstore–Vroman’s in Pasadena, CA. And Look! It was waiting for me autographed and everything! In Stanley Will Probably Be Fine, Stanley Fortinbras has a sensory processing disorder that makes loud sounds, visual cacophony, and crowds difficult to endure. But when the natural growing pains of middle school social life test his relationship with his best friend, he learns to strike out on his own and build new friendships. Central to his growth is his passion for comic books and his own creativity and courage, which allow him to enter into a world that seem like a gauntlet. Great story, great ideas, great sense of compassion, and just enough funny. In fact, there is a lot of humor here. You’d have to evil criminal mastermind not to love this book. Next Next post: Dogs get cold too!